We offer a 14-Day refund policy. You may request a refund for up to 14 days after you begin the course. To be eligible for a refund, you must submit your request to melissa@childproofparenting.com along with supporting materials listed below before 11:59pm Eastern US Time 14 days after the course begins. We will also check to see that you have watched the available course videos. No refunds will be provided after 14 days following the start of the course. All refunds are discretionary, and eligibility is determined only after all requested items are submitted to our support team. If you opted for a payment plan and you do not request a refund by the end of the 14th day, you are required to complete the remaining payments of your payment plan according to our 1 payment per month schedule. A copy of all your completed worksheets through Module 3. A brief description of the work you have completed and the practices you have been implementing. If you purchase the VIP Course + Private Coaching Sessions, the portion of your purchase that went toward your private coaching sessions is non-refundable. This workshop has very limited space and will only have a limited number of spaces for private coaching. Deciding after you purchase that you can no longer afford the payments, do not want to do the work, or don’t want to focus on changing your parenting anymore does not earn a refund. No refunds will be offered until after the start date of the program. After 11:59 PM on the 14th day, the refund period ends and absolutely no refunds can be made after that date and time. No exceptions will be made. This refund policy is designed to give you 14 days to try the course, get acquainted, and learn! If you do the work, put in your best effort, and feel that we haven’t delivered on our Childproof Parenting™ promise, we will issue a 100% refund. We ask for the above evidence as we only want students who are willing to be present in the course and actually do the work. We are giving our 100% effort to provide the best and most effective learning environment possible, and want our students to have the same high standard. You owe it to yourself to give it your best! 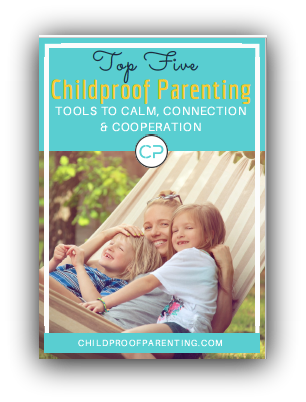 HAVE ANY QUESTIONS ABOUT THE CHILDPROOF PARENTING PROGRAM? DROP US A LINE, WE'RE HERE TO HELP!